I've got a couple more things that the mailman brought to show you today. And again, one is for me, and one is for one lucky winner!! Which would you like to see first? The one for you? Okay, fair enough. Can you believe the size of this ball of yarn?? Oh, well, I guess you really can't tell from the picture, but it's HUGE!!! (I should have put a quarter next to it for scale or something, huh?) 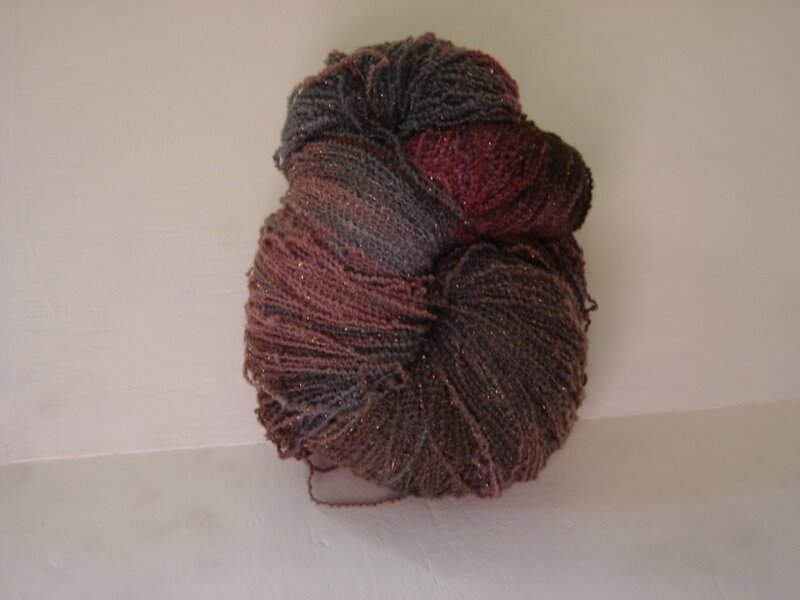 A big thank you goes out to Kimberly, who donated this beautiful, glittery ball of Cherry Tree Hill's Oceania. 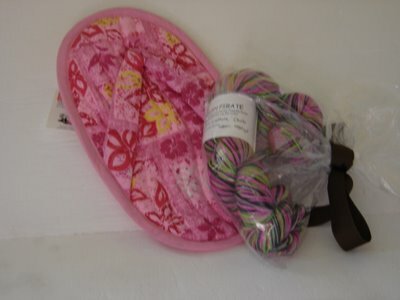 There is about 1440 yards here, so the lucky winner can knit up quite a project with this!! And what did the mailman bring me?? Take a look! The ever so sweet and generous Jill send out prizes to everyone who participated in her You Know You Knit Too Much When . . . . Swatch Contest. The sock yarn you see there is by The Yarn Pirate and is called "Culture Club". Just perfect for a girl who spent her formative years in the '80s. Oh how I loved Culture Club!! (I know, I know, what were we thinking in the '80s??) Ahhem. Okay, Jill also knows what a OCD clean freak avid housekeeper I am, and knew a foot mop would be perfect for me. It has already come in handy, since I'm also a klutz. I used it just yesterday when I had a little run in with some iced tea. Thank you so much Jill, I love it all!! I've got some more really exciting prizes coming up, so be sure to head on over and get your donation in. It looks like I may have to set my goal higher too - we've almost raised $500 already!! Glad you've raised so much money!!! Foot mop! That's so awesome - I would probably just wear foot mops on bith feet all day around the house. Think of the cleaning I could get done!! I bet the Oceania is beautiful in person! Re: Culture Club (the band)...I was a Talking Heads gal myself. Who needs a foot mop when you have three little dogs who are one inch from the floor? Another reason to get a dachshund? ingenius, those little foot mops. i was trying to find two that matched, but they'd all been picked through by the time i got there. still, they're so handy. (foot-y?) haha. that's a really fun yarn; such funky colors! thank you for your thoughts and well wishes. making others smile makes me smile, especially when i'm having difficulty finding things to smile about. Glad to hear you are closer to your goal! Foot mop!?!? What a cool idea. Yarn looks gorgeous! I think I have made up my mind what I am gonna send! Will have to do so next week. How wonderful that you're so close to your goal! Love the yarns! Foot mop! That's brilliant! Nice yarn too. Culture Club!!! Of course, you had to love them being an 80's child and all. But is it more weird to have BEEN in love with Boy George? Or to want to have been Boy George...of course he had the best makeup! Personally, I did not have a crush on him, but I went through a phase where I thought eyeliner on men was super hot. Adam Ant, Nick Rhodes, and of course, Robert Smith! Anyway, having rambled long enough, I am definitely going to send some money out for the walk. I haven't commented in a while, but I just wanted to let you know that I think it's so great you're doing this, and to thank you for sharing your own struggle. My mom and dad are both diabetic, so I guess chances are I'll get it some day. So again, thank you for doing this! Culture Club---It brings me back to the day . . . I love the colors, they are so, BOY GEORGE!!!! ooops--I forgot to say that I have actuallu seen and touched that oceana (no, it isn't part of my stash!) and the photo absolutely doesn't do it justice: it is really pretty! Heh-heh...Culture Club. Love that yarn! The little foot mop is too cute, is that a handmade item? Do you wish you could be like the Yarn Harlot?